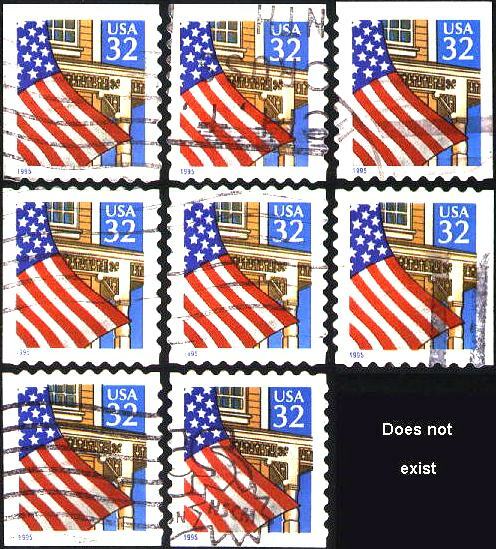 The 2920 is a self adhesive stamp from a convertible booklet of 20 2920a or from a MDI (Minnesota Diversified Industries) booklet of 15 or 30 (BK 226A and BK 227). "* Self-Adhesive / Do Not Wet" runs in an 45° or 36° angle from bottom left to top right (Type C45, C36) or inverted from top right to bottom left (Type D45, D36). Cursor on picture = blow-up. CB stamps start and end with a "Valley"
at top, MDI's with a "Peak". There are two different backings: "Stamps Worth Saving" and "National Domestic Violence Hotline". As far as I know, the panes of 20 occur with or without divots, the MDI booklets come with divots. To me it seems that the stamps from the panes of 20 can be distinguished from those from the MDI booklets by the sequence of valleys and peaks in the die cut. The pane stamps start with a valley at the top left corner of the horizontal die cut and end with a valley, the MDI stamps start and end with a peak. All other sides corresponding. All stamps from a pane of 20 without divots. 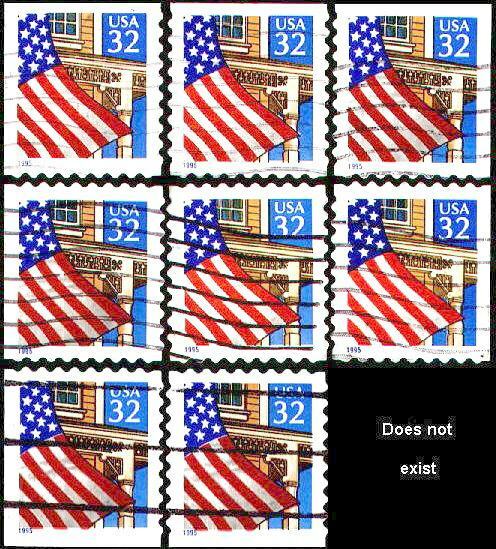 All stamps from a pane of 20 with divots. "National Domestic Violence Hotline" backing and a pane of 20 with a label of a convenience store. These are known with plate numbers V13831, V13824, V23422, V34745, V36743, V42556, V45554, V56663 and V78989.